Earlier this month when I was reading my Women's Running magazine, I came across an article where the writer was recapping her experience at the Rock n Roll Las Vegas half marathon. Right away I was intrigued because I ran RnR Las Vegas too. However, she ran it for charity. 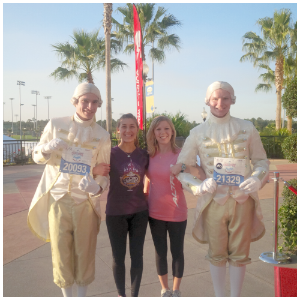 I'm sure we all understand the concept of running for charity, you raise money, then you go run. This lady was running for charity but she was doing it a bit differently. She was running as a chaser. When you run as a charity chaser, you start dead last! You place yourself in the very last corral (and if I remember Las Vegas correctly there were MANY corrals. I'm thinking at least 43), and you don't start until every last person crosses the start line. Your job as a chaser is to pass as many people as you can. Each person you pass is equivalent to $1 for your charity. In this instance, the lady running was sponsored by Transamerica Life Insurance, so Transamerica Life Insurance would be the company responsible for donating the money to the selected charity. Her charity was the Edith Sanford breast foundation. In the end she ended up passing 14,122 runners. That's a whopping $14,122 earned for the charity. 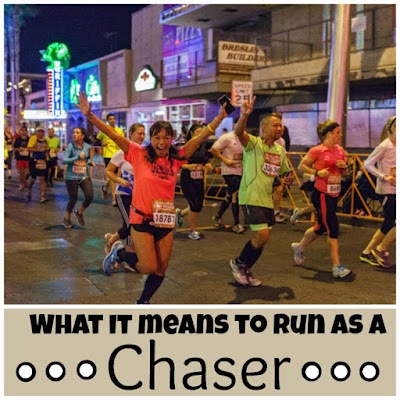 I love the idea of running as a chaser. Generally when we run races we are running them for ourselves and setting our own goals and trying to improve our own times. Running as a chaser is not about us at all. It's not about our own PR. Its about something so much bigger! I'm sure there are stipulations to running as an "official" charity chaser. They only have one chaser per race so I am gonna guess its a difficult position to get. However, if you are not worried about time or corral placement, it might be fun to run non-officially as a chaser at some race and see how many people you pass. Would this interest you? I've never heard of this before - sounds like a fun way for runners to raise money for charity! I have never heard of this before, but it sounds like a great concept. Although, I don't think I will ever get to this point, as running will always be a challenge for me. Wow! this sounds really really cool!! a really cool new way to find motivation! What a great idea! I would love to do something like that for a charity. It would be so motivating because I feel like you would push yourself pretty hard because you know that with each person you pass, you are raising money! I think you would make a great chaser since you are so speedy! Haha! And I would shame everyone too. I'd be like "If you let me pass you, I will earn money to help cure diseases!!!" Our December race does this with a local business sponsoring the runner, but I also know NYC does this with a celebrity runner. That is cool that your local race does it! I read that as well and love the idea. I've seen lots of races do this type of thing. Really fun! This was the first time I read about this and I was intrigued! Wow, I've never heard of this before. It sounds like it would be a really cool experience. Yea, I bet the people who do it have the best time! 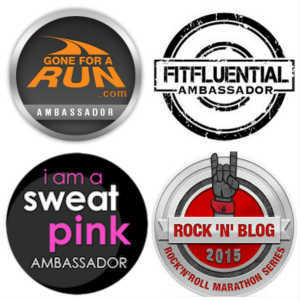 I have heard of this, I knew a few companies that sponsored runners to do it. But and maybe this is just a few but I have heard they sponsor faster runners or runners who have built their name up in the running community to do it so the $ raised is higher so they can get their companies name announced in the media more. But hey if I was a runner like that heck ya I'd do it for the free travel and free race entries, the fact that your doing it for charity and sponsors would just make ya train and push harder I would think so you could pass as many possible and help earn a ton for charity! I'd be fun! Yea, it would definitely have to be a fast runner! Yea, it would be fun to find smaller races that did this! That sounds like SO much fun!!! I would totally do that. In fact, I might start! Great! Let us know if you do. Never heard of the concept, but it sounds like a BLAST! Passing people is so motivating to me. I'm so competitive. I think something like that would really fuel me! This was actually the first time I've heard of it too! I've never heard of this concept before, but really like it. If you're motivated to raise money for charity, then you'll definitely push yourself as hard as you can on race day. This sounds like a blast! I would love to do something like this! I'd say cheer for everyone you pass along the way too. :-) Make it about the community too! This would be so fun! I've never heard of this but I would definitely be interested in doing it! This is a cool idea!! I like that it adds a challenge to a race AND supports a charity! I've never heard of this but yes! I'd totally do it! You know how competitive I am! Now THAT is a cool concept I've never heard of before! What a neat idea and a great way to raise money for charity! Now that I read this, I suspect the two runners who were carrying big mylar balloons (and who passed us) during the Houston marathon/half were chasers. I later saw in the starting video that they crossed the start line dead last, so that makes sense. Oh that's cool that you saw them. Now that you know who they are/what they're doing, you'll be on the look out for them next time! Have never heard of this before, but it does sound like fun. The hardest part would be dodging a bunch of people. Very neat! I thought a chaser was what I was when I started running with our local running group, and I was trying to catch up with them at every run! lol ! Wow, I've never heard of this, and it sounds awesome!! What a cool way to challenge yourself AND raise money for charity. I would totally do this; I think I've definitely reached that "PR plateau" you speak of, so it couldn't hurt, haha. I love the idea of being a chaser, but how do you know you are the chaser and someone else isn't signed up for it? Seriously interested! Hook me up! There is only one chaser per race! I have never heard of this concept. It's very interesting. It think it would also satisfy that competitive urge that most runner's have...just in a different way.